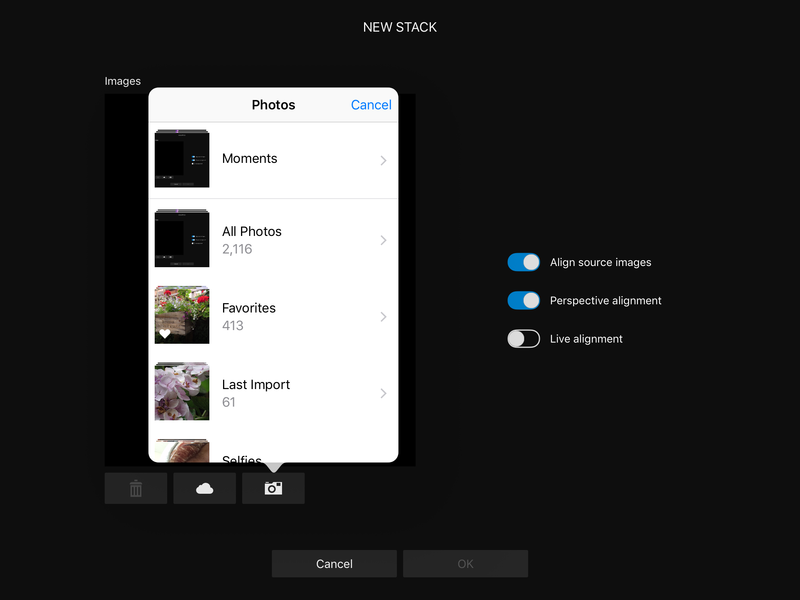 Presently I don't see a way to make multiple iPhoto Selections for Stacks. Once I've made a single selection I have to go back into iPhoto, remember where I was and select the next. This can't be meant, surely? 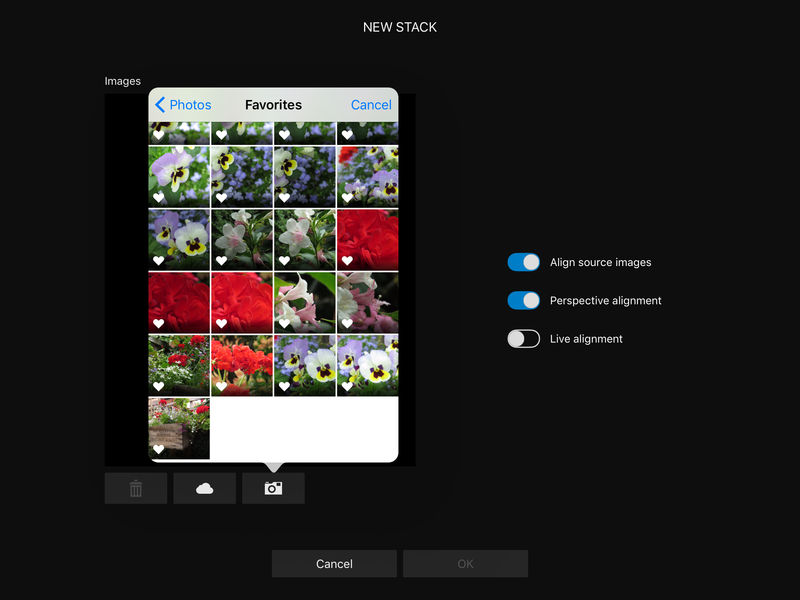 There has to be a better selection process that doesn't close iPhoto after making my first iPhoto Stack photo. 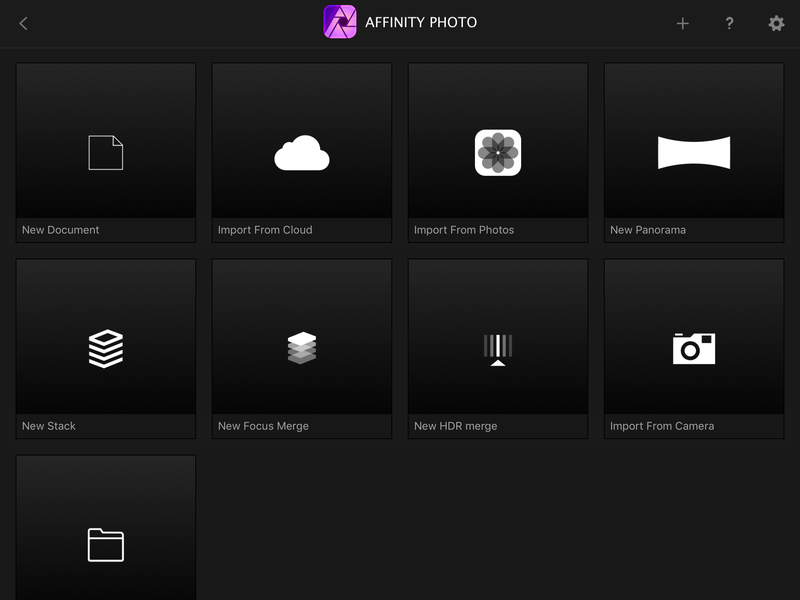 I have Corel PSP Ultimate, AFTERSHOT PRO, Pixelmator and am now enjoying the freedom of Affinity Photo. How are you creating the Stack? You have to go to File ▸ New Stack, click the Add button, select Photos from the Media section on the list on the left in the Finder dialog, then iPhoto on the top right of the same dialog, finally press and hold ⌘ (cmd) and click the photos you want to use for the stack. 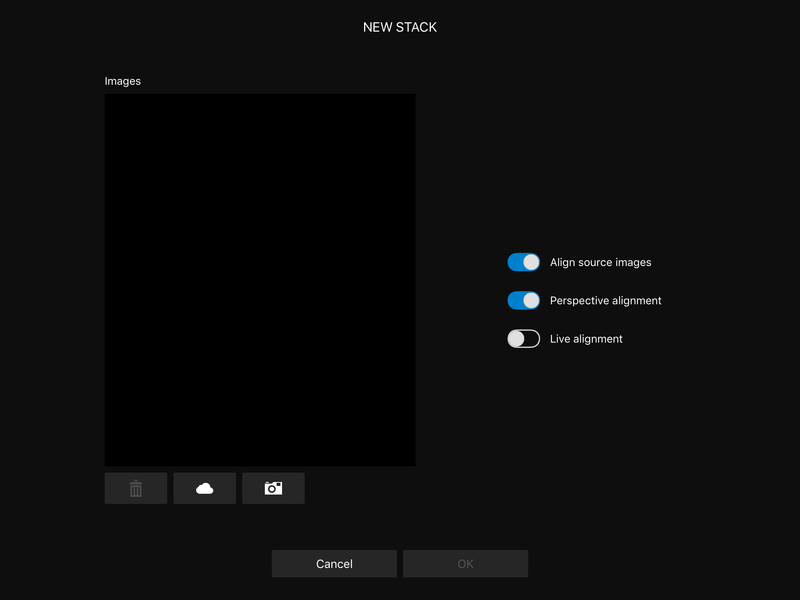 Back to the Stack dialog, all selected images should appear there then click OK to stack them. All images will be placed inside a Live Stack Group layer in the Layers panel - you have to click the small arrow on the left of the layer's thumbnail to expand the stack a see all the images. Note that this process will import/stack the images as JPG's. If you want to work with RAW files you have to export them from iPhoto as originals to a folder and import from there. Please see the attached files for the workflow. I am not able to select multiple iphotos, just one iPhoto. Please ignore my previous reply. I thought you were talking about the Mac version, not the iPad version. 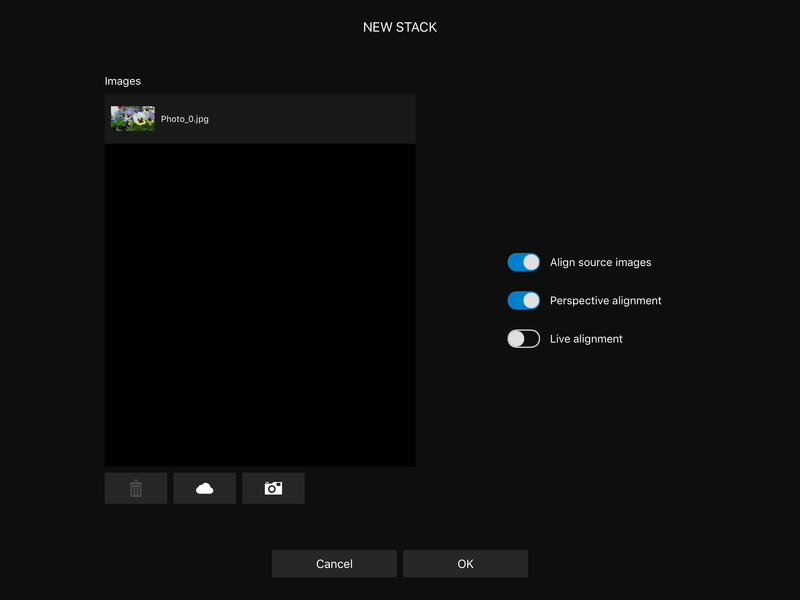 Currently It's not possible to select multiple images when creating a Panorama, Stack, Focus Merge or HDR Merge. Files must be opened one by one. This is a known limitation which we hope to see improved/solved with iOS 11. Ah, I should have said I'm on an ipad air2, ios10. OK, please correct me, is a Stack purely for Panoramas? I'm not wanting to create a Pano, I was wanting to select multiple iPhotos directly into Aff as Layers. No, stacks can serve different purposes, from removing noise or objects from an image to exposure merging, focus merging etc. Stacks use a set of similar images (usually) from the same position/angle taken at a different time or with different settings and use information from all of them to achieve a particular result/goal as those discussed in the linked video tutorials, while panoramas use different images from the same place taken along an axis for stitching creating a single larger/composed/stitched view of the original images. To import images as new layers tap the ellipsis icon (the three dots) on the top (in Photo Persona), select Place then select if you want to import the image from Apple Photos or from a cloud service. Then tap the screen to place the selected file as a new layer. Is there any, any way to select multiple photos and have them imported as Layers? Or do I need to import separately using Place?